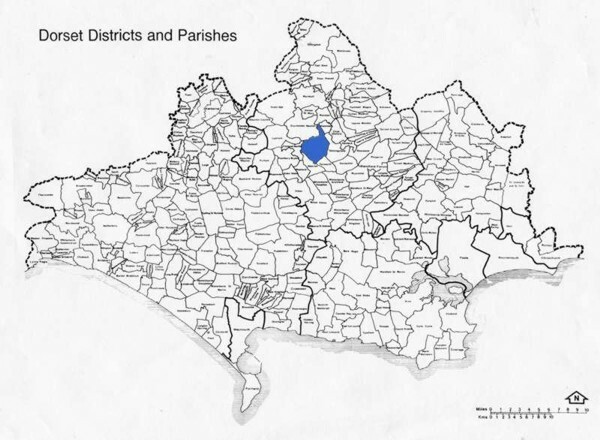 Or for a map of Dorset Parishes, click >here< Click >here< for the weather. This "Notice board" for our village was created 0n 26th February, 2012; it is updated quite frequently, so do come back often to see what's new. Advertise your events here for FREE. This WebSite is totally independent of any other organisation. This WebSite now has two "rivals", both better, and the WebMasters more skilled, and dedicated. Click >Tim's< or >Derek's<. Each of the three has something different to offer, so this WebSite will continue... There are also other relevant WebSites, see >here<. Below are events happening in the village today or very soon; for further ahead, see the Village Diary. were sold by the Pitt-Rivers Estate, on Thursday. 28th July, 1966. The building at the bus stop, next to the Shop, that houses the old Fire Engine, is now owned by the Parish Council; it is hoped this will remain a village museum. If not, click here ! 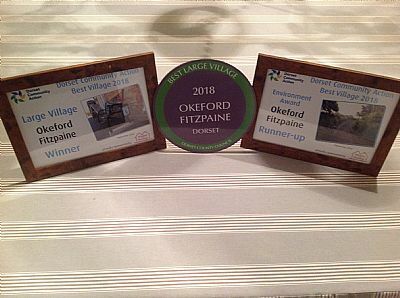 I am very pleased and proud to announce that Okeford Fitzpaine has been awarded "The Best Large Village in Dorset 2018" presented by Dorset County Council in association with the Dorset Community Action. The event is sponsored by Magna Housing Association with over 40 villages entering the competition? This is a fantastic accolade and is as a result of a concerted effort by community volunteers and residents in presenting and keeping our village up to a very high standard. Thanks to everyone who gave their time over the past 4 months to cleaning and tidying up the village and to those who planted and maintained the flower boxes/baskets. A plaque will be installed in the centre of the village to commemorate this event. In addition we were awarded the runners up title in the Environment Award where the Little Lane Project was judged in great esteem. Congratulations to Dilys and Jeremy for their efforts in achieving this award. All in all this has been a wonderful year in recognising the Beauty of our village and the pride that has been shown by residents. Both The Daily Echo and Radio Solent will be reporting on this event. She uses the term "MI" - that stands for "Myocardial infarction", the technical term for a heart attack. I had my MI at about 10:30 PM with NO prior exertion, NO prior emotional trauma that one would suspect might have brought it on. I was sitting all snugly & warm on a cold evening, with my purring cat in my lap, reading an interesting story my friend had sent me, and actually thinking, 'A-A-h, this is the life, all cozy and warm in my soft, cushy Lazy Boy with my feet propped up. I unlocked the door and then lay down on the floor as instructed and lost consciousness, as I don't remember the medics coming in, their examination, lifting me onto a gurney or getting me into their ambulance, or hearing the call they made to St. Jude ER on the way, but I did briefly awaken when we arrived and saw that the radiologist was already there in his surgical blues and cap, helping the medics pull my stretcher out of the ambulance. He was bending over me asking questions (probably something like 'Have you taken any medications?') but I couldn't make my mind interpret what he was saying, or form an answer, and nodded off again, not waking up until the Cardiologist and partner had already threaded the teeny angiogram balloon up my femoral artery into the aorta and into my heart where they installed 2 side by side stints to hold open my right coronary artery. 2. Note that I said 'Call the Paramedics.' And if you can, take an aspirin. Ladies, TIME IS OF THE ESSENCE! Do NOT have your panicked husband drive you - he will be speeding and looking anxiously at what's happening with you instead of at the road. Do NOT call your doctor -- if it's at night you won't reach him anyway, and if it's daytime, his assistants (or answering service) will tell you to call the Paramedics. He doesn't carry the equipment in his car that you need to be saved! The Paramedics do, principally OXYGEN that you need ASAP. Your Dr. will be notified later. Please be a true friend and share this article with all your friends, women & men too. Most men have female loved ones and could greatly benefit from knowing this information too! As you may know, there is a lot happening in the Village regarding several Planning Applications that have been made to build New Houses. The Parish Council has been considering these Applications and has decided that it is a good time to consider the future of the Village Hall – at the last Council Meeting on the 6th March, the formation of a small Project Team was approved. This Team will look at the viability and suitability of the current Hall, to serve the needs of the Village for at least the next 50 years. If it is considered that to achieve this aim, the solution is to make improvements to the Hall, or to look at other options, the Team will undertake the necessary research and consultations, to obtain the key information before making recommendations to the Council. The team has only just been formed and therefore at this stage, we need to do the initial research before taking things forward. We will however ensure that every resident has the opportunity to give their views on what should happen, after the key issues have been identified and an action plan has been drawn up. We will work closely with Parish Council and other parties including the Village Hall committee, and ensure that progress is reported to the residents, when appropriate. It needs to be stressed that this Team will only be making recommendations for the future of the Hall, and cannot make any decisions. The Parish Council will consider the recommendations and decide how to proceed. There are currently 3 members of the Team – Jeremy Gartside, Andrew Vickers and Ian Berry (Lead) - and other people will be asked to join when the need arises. Members of the public can share information on dangerous drivers, and highlight areas where they are concerned about excessive speed. IF someone should make a report, "human nature" means that it is likely to be ignored; but if LOTS of people make similar reports, THEN it is more likely to be effective. It's the squeaky wheel that gets the oil. f you click on one of the buttons on the right, or at the bottom of the screen, it takes you to an advertising site, over which I have NO control - that's why this WebSite is free. Sorry about that - but you have been warned! All proceeds to St. Andrew's Church. Mobile speed camera locations in Dorset. Dorset Police will be looking to catch out bad and inconsiderate drivers as part of their 'No Excuse' campaign. NO social or church, etc. activities shown. tab at the bottom on the left. Nothing special of which we are aware. If you know better, let us know, so that we can post it here. For FREE ! Leave a message via the "CONTACT US" Tab on the left of your screen. or the VILLAGE DIARY Tab. The Village Community Group have raised funds for the provision and instllation of a life-saving Defibrillator now installed in the village. This will serve all ages in the event of a heart attack and will assist the Medical services more speedily to aid recovery from such an event. The installation of this facility has been notified to all households in the village with simple instructions on what to do in the event of such an occurrence. This is a vital life-support system in an area where we are distant from the emergency services, who will fully support the operation and upkeep of the defibrillator. Panhandlers in Miami no longer have to find scraps of cardboard and pens to make their signs pleading for handouts. A local sign shop has donated plastic signs with begging messages — plus an advertisement for the sign shop. “We ... put them to work in a way,” claims the shop owner. “While they’re out there doing their thing, they’re also advertising my business.” He says he will pay the panhandlers a percentage of any business he gets from people who see the signs. (Reuters) ...Your task: guess which one is the bum. SUPERFAST BROADBAND IS HERE ! Word was out that BT Openreach had enabled the fibre optic connection to Okeford Fitzpaine on 18th Feb 2017, and BT’s website connection checker revealed that, yes indeed, superfast broadband is now possible at an estimated speed for a specific connection. The actual wording was “Yes! You can get superfast BT Infinity Fibre broadband.” For my phone number and address “You could get 45-64Mb Estimated download speed range”. So does this mean that we are now automatically speeded up? NO! Does this mean that as BT Openreach installed the cable that we must use BT? Also NO! Can I check today, the actual speed I could get on the speed checker? Again NO! To make use of this facility a new, Fibre contract has to be arranged, just like when getting the old standard broadband. There is a wide choice and range of prices from many companies. Some deals are for broadband only, some add weekend and evening phone calls, some offer anytime phone calls, others add TV, mobiles etc. Prices start at lower speed ceilings, up to 16/17 Mb, increasing to up to 38,76,100,150Mb, with bells and whistles. Your actual available speed depends on your distance from the nearest, green junction box, where the fibre optic cable ends and copper wire to your house begins. For me that is opposite the village shop. Speed decreases with distance along copper wire from that box. www.productsandservices.bt.com/products/speed-checker, to check availability and get a speed estimate. The speed checker further down the page will only check the current ADSL connection. http://www.money.co.uk/broadband/fibre-optic-broadband-deals.htm, to see a very wide choice of providers (ISPs). Note the More button at the foot of the list for further pages. Click to the ISP website for up to date information and contact details. Finally, if you have a good deal for your home phone, you do not have to stay with the same company for fibre broadband. It might be cheaper to mix, however it might be cheaper to match, phone and broadband from the same provider, which may or may not be your current one. How to get it Choose an ISP and elect to get a fibre enabled connection. The ISP will probably arrange for a BT engineer to visit (though some don’t) and install a replacement front cover for your main phone socket, plus supply a fibre modem and fibre compatible router, though combined modem/routers are starting to be provided. The router will be a basic model but sufficient for most users. The engineer should check your available speed, after which you can choose a contract, according to your requirement and pocket. Bottom Line If your current Broadband satisfies your needs, there is no need to change anything. There is bags of information on line to tell you what a fibre connection can offer. The Fippenny News comes out at the beginning of each month. If you don't already receive a copy, we can arrange delivery - just drop us a line through the CONTACT US tab on the left of your screen. or £3 a year, delivered to your door. Mike Wood and his Committee have prepared a very useful (and free) "Welcome" booklet to help you. Click on the "CONTACT US" Link on the left of your screen, and ask for it. The Church is also open every day for private prayer - or simply somewhere to go to meditate alone, away from the cares of the world. See The Fippenny News for full details of services. Price £1, profit goes to Church funds. can be dropped off at the school. A talk once a month. Don't forget to check out the "What's On" Tab on the left of your screen, for future events. If you have anything you would like added, click on the "CONTACT US" Tab on the left of your screen. It's FREE ! If you click on one of the buttons on the right, or at the bottom of the screen, it takes you to an advertising site, over which I have NO control - that's why this WebSite is free. Sorry about that - but you have been warned!